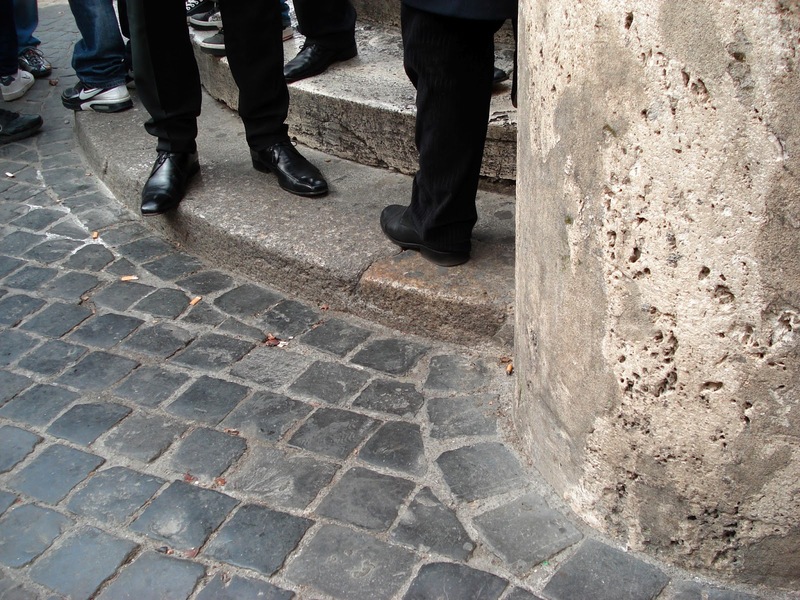 Shoes are one of the clothing items that identify North American men and women in Europe. Tourist sneakers behind Italian men's shoes at the Spanish Steps in Rome. Nice: S.K., Canadian lawyer who spent some time in the south of France, suggests a pair of comfortable yet "fashionable" shoes to wear day-to-day when exploring. 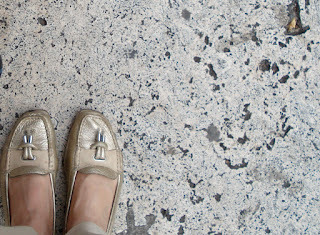 My (JoyD's) preference here is a pair of muted metallic Geox loafers with a sand upper band. I quite like metallic against a tan in the summer, no matter how conservative the shoe is. 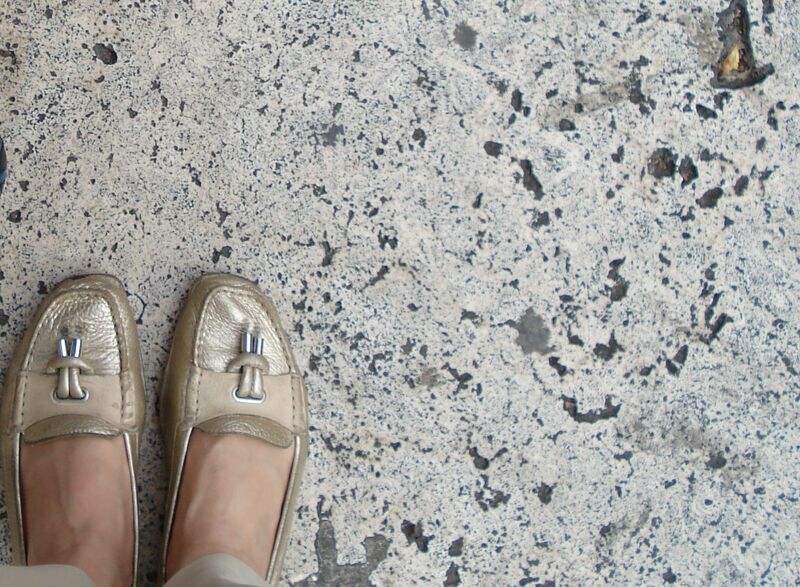 These loafers have been relegated to garden wear now but they comfortably took me to France, Italy, Spain, & Germany. 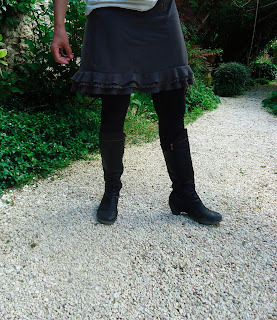 I wore them with knee-length shorts, trousers and my favourite denim pencil skirt. 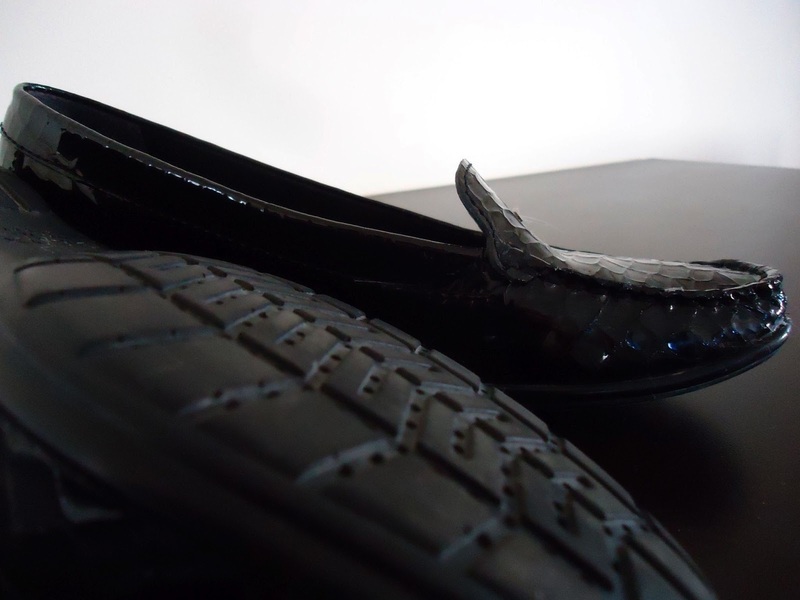 They were more comfortable than any of my ballet flats and I could manage long days of walking in them. Black Geox Loafers. Photo by JoyD. Since them, I have gone through a black patent Geox pair as well. They too were comfortable and did allow me a bit of fashionable leeway in the style department rather than my New Balance running shoes. 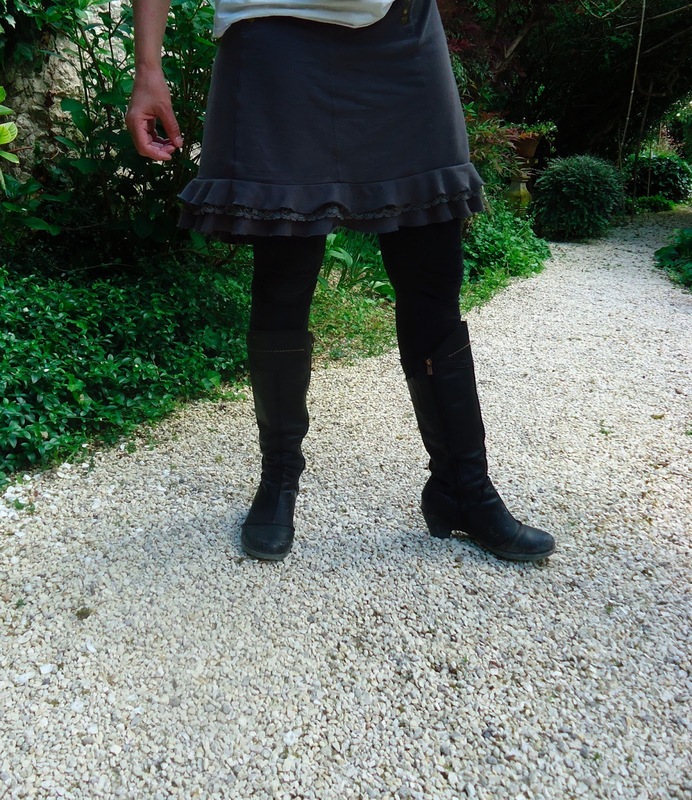 Boots are another NICE addition to shoes and sandals. MellyO from Winnipeg brought two pairs of footwear while traveling Great Britain, France and Spain in April and May of 2013 - a pair of boots and a pair of sandals. Unfortunately because of the weather, she had to wear them more than she wore her sandals. Boots are definitely a NICE spring traveling choice. Think about buying shoes while in Spain. The Spanish love shoes and the variety and range of prices in Spain will fit any budget. NO THANKS: S.K. 's experience with running or hiking shoes has been a general NO THANKS - unless you are wearing them to actually run or hike, or want to look like a tourist! 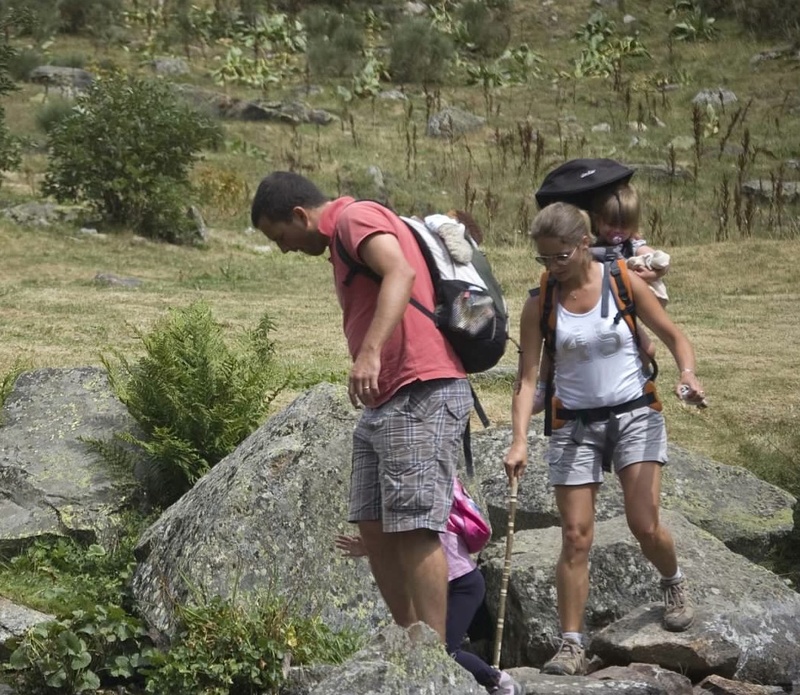 This French woman from Lyons, in the photo, who was hiking in the Pyrénées with her family would only wear the shorts, tank top and running shoes while walking/hiking in a country setting. Trust me, other than this environment, you would not see her dressed in this way. We have known each other for twenty years and this is the only time I have seen her dressed in shorts and a tank top, other than when she was in Canada at a lake setting. Yet we see North American tourists (of all ages) in European cities dressed exactly in the same way. In the photo to the left, what do you see? French walking/hiking club or North American tourists? 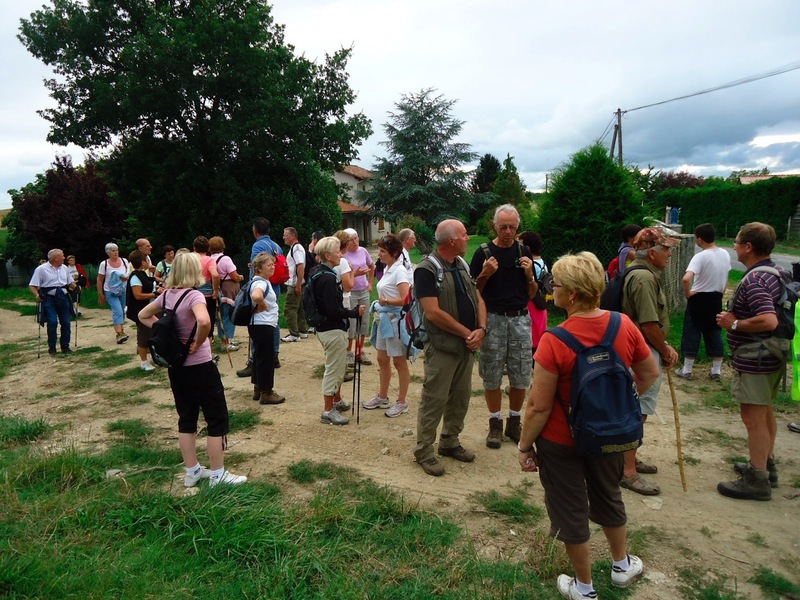 The answer: a French walking club - the walking sticks give it away but change the environment to a city street without the walking sticks and it could very well be a North American tour group in Europe. 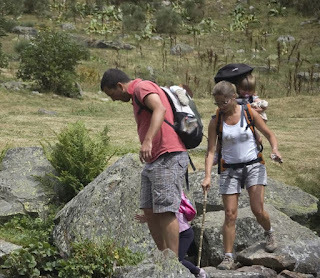 If you are hiking in the Pyrénées - NECESSARY; sightseeing in Rome, Paris, Lyons, Bordeaux or Barcelona - NO THANKS! The locals know we're tourists, let them at least think that we are well-dressed tourists. When Cathy, a friend from France, was visiting Canada, she spied a shop called the "Running Room" and wanted to see what they had in store. After trying on a pair or two of "running shoes" she exclaimed that maybe she would wear them while in Canada, but she would never wear them in France. So unless you are actually involved in the sport of running or hiking in the woods or mountainside, do not consider them for your walking tours in the city. As well, add "flip flops" in the cities to the NO THANKS list. Bring them along or plan to buy them if you end up at the beach.